Liposomes are small spherical vesicles with walls comprising two layers of lipids and containing an aqueous core. These artificial structures have been developed for drug delivery or as carriers of active substances in cosmetic products. Another possible application involves the encapsulation of magnetic nanoparticles in liposomes to use them to transmit signals. This possibility is discussed in an article published by a group of Brazilian researchers supported by São Paulo Research Foundation—FAPESP in Royal Society Open Science. "Our research belongs to the sphere of basic science but has potential applications in such fields as computational signal transmission, for example. We built a model with two sets of liposomes. One type was nanometric, with a size of about 100 nanometers, and the other was a group of 'giants' measuring 10 to 20 micrometers," said Iseli Lourenço Nantes Cardoso. Cardoso is a Full Professor at the Federal University of the ABC (UFABC) in Santo André, Brazil and was co-principal investigator for the study. The other principal investigator was Frank Nelson Crespilho, a professor at the University of São Paulo's São Carlos Chemistry Institute (IQSC-USP). The nanometric and giant liposomes used in the model were designed to mimic drug carriers and cells, respectively, and to fuse with each other. 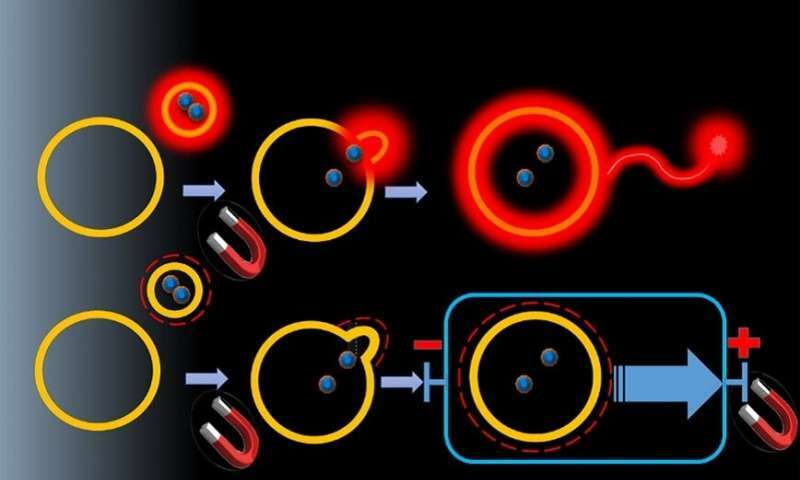 Instead of delivering drugs, however, the nanometric liposomes transported magnetite nanoparticles with fluorophores (fluorescent molecules) or electrically charged lipids. The fluorophores and charged lipids were used to transmit signals, while the magnetic particles were used to control transmission by means of magnets. "In the initial situation, the giant vesicles had no fluorophores, charges or magnetite nanoparticles. Upon fusing with the nanometric liposomes, which contained luminous or electrical information, the giant vesicles incorporated this information. They also incorporated the magnetic particles and hence could be drawn by a magnet to the signal-receiving station. This created the possibility of an on/off mechanism. When the magnet moves the vesicle toward the receiving station, we have the 'on' state. When it's in the opposite direction, we have the 'off' mode, and the signal is blocked," Cardoso explained. "In the case of the light signal, the giant vesicles were conducted by a capillary tube to a fiber-optic connection and from there to a spectrofluorimeter, which recorded the fluorescence spectrum. For the electrical signal, we used a magneto-electrochemical signal transmission system. When the electrically charged molecules are conducted to an electrode by a magnet, a high signal occurs. If the magnet is removed, the signal is very low," he said. According to the researchers, these devices can be used to perform Boolean logic operations in which the variables and functions have values only of 0 and 1. These would be combined in pairs to create four dyads: 0-0, 0-1, 1-0 and 1-1. The first dyad (0-0) would be the giant vesicle without fluorophores, charges or magnetite particles. With fluorophores but no magnetite, the device produces but does not transmit a light signal (0-1). With magnetite but no fluorophores, the giant vesicle can be transported but does not transmit a light signal (1-0). With both fluorophores and magnetite, it transmits a light signal (1-1). The study was conducted as part of the Thematic Project "Interfaces in materials: electronic, magnetic, structural and transport properties", for which Professor Adalberto Fazzio is the principal investigator, and demonstrated for the first time that magnetic nanoparticles can be used at the liposome interface to transmit luminous or electrical signals.